The thing with Tan is that she makes me laugh. And she shakes with fear beside me even as she tries to be brave. In Truly Tan Jinxed! Tan’s Dad buys an old tram from the junk shop but this isn’t just any tram. This tram is JINXED. The whole town knows it. With creepy words graffiti-ed on its body, anything could happen. Tan is determined to unravel the mystery of Miss Havisham and the jinxed tram before someone gets hurt. But she can’t do it without her friends. 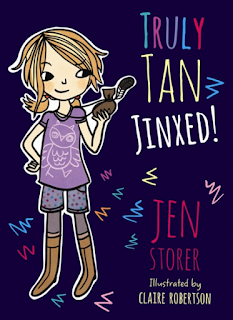 When everything spirals out of control, Tan comes up with a wacky solution but the stars align at just the right time. Whether or not you’ve read the other Truly Tan books (Truly Tan, Truly Tan Spooked! and Truly Tan Freaked) you’re in for a rollicking tale.